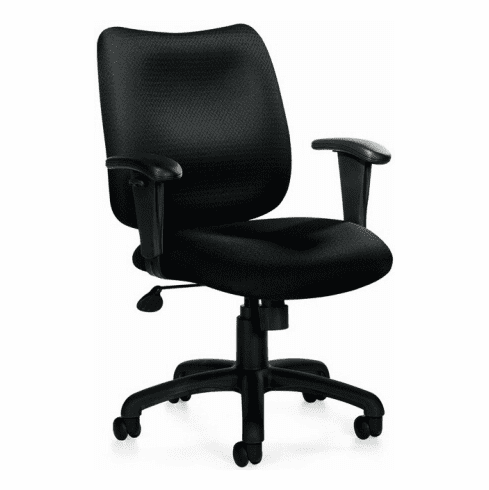 Offices To Go™ Task Chair with Armrests [OTG11612] Free Shipping! This office task chair from Offices To Go™ features durable, stain resistant fabric upholstery over thickly padded seat and backrest cushions for all-day comfort. Other features of this task chair include tilt with tilt lock and tilt tension adjustment, pneumatic seat height adjustment, fixed back angle, height adjustable armrests and a durable molded five star angled base with twin wheel carpet casters. This office task chair meets or exceeds ANSI/BIFMA standards. Dimensions: Seat Size: 20"W x 18"D. Back Size: 18.5"W x 17"H. Seat Height: 16" - 20"H. Overall: 36"H x 26"W x 26"D. Five year warranty from Offices to Go. This chair normally ships within 1-2 business days.